Start spring right with limited-time savings on key services and Original BMW Parts. Choose one rebate offer or combine for savings up to $150, available through April 30, 2019. 1 All work is carried out by BMW Trained Technicians using Original BMW Parts, which come with a two-year unlimited mileage limited warranty. Warranty repairs do not constitute an extension of the original limited warranty period of the vehicle or a part thereof. 2 Services and oil services covered under a BMW Maintenance Program are not eligible. 3PURCHASE: Any of the 4 services outlines above at a participating BMW Center between 3/10/19 and 4/30/19. CLAIM: Go to http://bmwaftersalesoffer.com, sign up and complete the online Claim Form. All submissions must include the VIN, BMW Center name, Repair Order number and Rebate requested. Submit all Claims by 5/15/19. RECEIVE YOUR REBATE: Once your Claim is validated, within approximately 2-3 weeks, you will be sent an email to register for your Virtual Visa® PrePaid Card. Register at the website provided in the email to immediately access your Virtual Visa® PrePaid Card. Upon registration, you may alternatively request a Virtual Visa® PrePaid Card be mailed to you. You should receive your Virtual Visa® PrePaid Card, if requested, within 4-6 weeks of your request. VALIDITY OF OFFER: Offer is valid only in the U.S. and Puerto Rico. Offer is void where taxed, restricted or prohibited by law. Offer is valid only for persons who have a valid email address and purchase the eligible BMW services in accordance with the terms herein. Eligible for BMW vehicle owner or end user only. Valid at participating dealers only. Please visit bmwusaservice.com/springservice to find your nearest participating dealer. TERMS AND CONDITIONS: Submit an online rebate claim form for all submissions. Incomplete submissions will not be accepted or fulfilled. Non-eligible submissions will not be acknowledged. All rebates will be issued in U.S. dollars. We are not responsible for lost or misdirected mail or illegible entries. Fraudulent submissions could result in federal prosecution under the U.S. Mail Fraud Statues (18 USC, Section 1341 & 1342). The Virtual Visa® PrePaid Card is not redeemable for cash and may not be used for cash withdrawal at any cash-dispensing location. Each time you use the card the amount of the transaction will be deducted from the amount of your available balance. Use your Virtual Visa® PrePaid Card online or via mobile only. Physical Visa® PrePaid Cards can be used everywhere Visa® debit cards are accepted in the U.S. Valid only in the U.S. and U.S. territories. Visit bmwaftersalesoffer.com to view full terms and conditions governing this card. The card is issued by The Bankcorp Bank, pursuant to a license from Visa U.S.A. Inc. Pay close attention to the expiration date, which is six (6) months from activation. You will not have access to the funds after the expiration date. 1 All work is carried out by BMW Trained Technicians using Original BMW Parts, which come with a two-year unlimited mileage limited warranty. Warranty repairs do not constitute an extension of the original limited warranty period of the vehicle or a part thereof. 2 Services and oil services covered under a BMW Maintenance Program are not eligible. 3PURCHASE: Any of the 4 services outlines above at a participating BMW Center between 3/10/19 and 4/30/19. CLAIM: Go to http://bmwaftersalesoffer.com, sign up and complete the online Claim Form. All submissions must include the VIN, BMW Center name, Repair Order number and Rebate requested. Submit all Claims by 5/15/19. RECEIVE YOUR REBATE: Once your Claim is validated, within approximately 2-3 weeks, you will be sent an email to register for your Virtual Visa® PrePaid Card. Register at the website provided in the email to immediately access your Virtual Visa® PrePaid Card. Upon registration, you may alternatively request a Virtual Visa® PrePaid Card be mailed to you. You should receive your Virtual Visa® PrePaid Card, if requested, within 4-6 weeks of your request. VALIDITY OF OFFER: Offer is valid only in the U.S. and Puerto Rico. Offer is void where taxed, restricted or prohibited by law. Offer is valid only for persons who have a valid email address and purchase the eligible BMW services in accordance with the terms herein. Eligible for BMW vehicle owner or end user only. Valid at participating dealers only. Please visit bmwusaservice.com/springservice to find your nearest participating dealer. TERMS AND CONDITIONS: Submit an online rebate claim form for all submissions. Incomplete submissions will not be accepted or fulfilled. Non-eligible submissions will not be acknowledged. All rebates will be issued in U.S. dollars. We are not responsible for lost or misdirected mail or illegible entries. Fraudulent submissions could result in federal prosecution under the U.S. Mail Fraud Statues (18 USC, Section 1341 & 1342). The Virtual Visa® PrePaid Card is not redeemable for cash and may not be used for cash withdrawal at any cash-dispensing location. Each time you use the card the amount of the transaction will be deducted from the amount of your available balance. Use your Virtual Visa® PrePaid Card online or via mobile only. Physical Visa® PrePaid Cards can be used everywhere Visa® debit cards are accepted in the U.S. Valid only in the U.S. and U.S. territories. Visit bmwaftersalesoffer.com to view full terms and conditions governing this card. The card is issued by The Bankcorp Bank, pursuant to a license from Visa U.S.A. Inc. Pay close attention to the expiration date, which is six (6) months from activation. You will not have access to the funds after the expiration date. 4Brake Service must include replacement of front or rear pads and/or rotors. 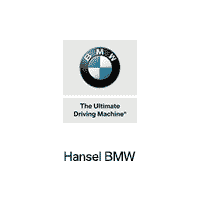 Valid only at Hansel BMW of Santa Rosa. Coupon must be presented at time of write-up. Excludes M vehicles, diesels, vehicles with staggered wheels and tires, and Integrated V alignments. Tire rotation and balancing can be performed. Does not include tax and hazardous waste fees. One coupon per customer, per visit. Not valid with any other offers, promotions or specials. Not to be issued to reduce outstanding debt, as cash values. Not retroactive. See dealer for details. Void where prohibited by law.